It was two years ago since I first attended a baby shower - it was for Mila Alessandra Flores-Olaguer. I still remember how fun and intimate it was. As a first-time mom, that baby shower helped ease a lot of the stress and anxiety I was feeling. It's not the gifts of baby stuff but all the well wishes and the camaraderie that made things more special. I knew then that my small family of almost three will have the best support group from friends and family, no matter what. Last month, it was a very pregnant Andi Manzano-Reyes' turn to celebrate as a first-time mom. 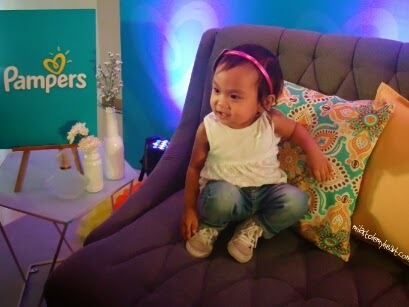 During the launch of the new Pampers Baby Dry, Andi was featured as its newest brand ambassador. The event was all about Love at First Sight and how to make every single day free from worries for moms and just full of firsts for babies. Communications manager of P&G (Singapore), Inc. Lisa Cunningham, country marketing manager of P&G Distributing (Phils. ), Inc. Jan Ang and brand manager Camille Aquino enlightened all mommy guests including myself about the company's newest surprises. 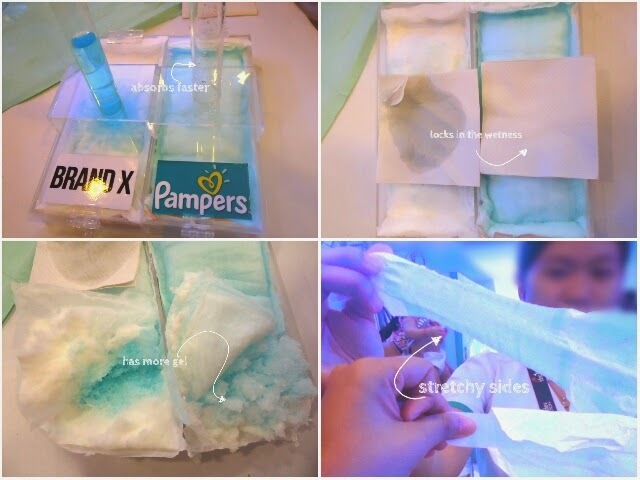 Pampers highlighted how its driest diaper in 10 years helps babies achieve their many firsts in life and how mommies can celebrate them in a more delightful way. “Ever since 1956, Pampers has made it its purpose to care for every baby’s happy, healthy development through providing complete sleep for babies all around the world,” said Cunningham. “And today, we are launching another series of firsts – which are all designed to help your baby achieve milestones every day,” she added. Host Gelli Victor, a new mom herself, and Andi sat down with partner pediatrician Dra. Apple Alfonso. According to her "Babies need twice as much sleep as adults. Sleep for them isn’t just about resting, it is about the overall development of their health" A wet diaper, among others, is a big no no when babies are sleeping. No matter how hard I've tried, I've never been successful on changing wet diapers and not wake Mila up. Worse is when the diaper gets too full that she feels the wetness. She will not only get her needed sleep, she will surely be cranky. This is where a good diapers is needed and Pampers is there to ensure up to 12 hours of dryness to help baby get complete sleep. During the event, Pampers Baby Wellness Specialists assisted us with a live demo. We were given 1 Pampers Baby Dry diaper and another from a different brand. We poured the same amount of liquid though a tube to the diapers. It was evident how different each diaper absorbs the wetness. Pampers absorbed the liquid a lot faster and the wetness was distributed evenly as it locks it in. When I touched the Pampers Baby Dry a few seconds after the liquid was poured, my hand stayed dry. It was not the same for the other brand. More so when I put a little pressure. Another innovation I love is the stretchy sides that can extend for a much a 12 inches on each side and still keep its shape. Fitting for an active toddler like my daughter. If there's any thing I would like changed, I wish the Pampers Baby Dry comes in pull-ups variant since Mila already knows how to remove the diaper tapes. With that said, the tapes of Pampers Baby Dry works well enough and is not so easily removed. I was with Mila and Hubs during the event and she definitely had fun. 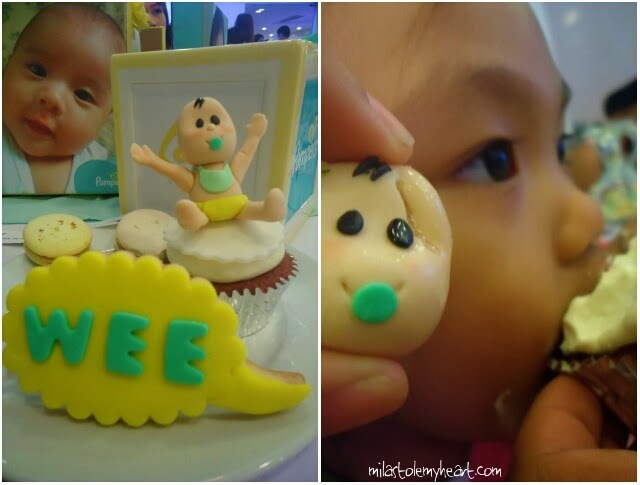 Mila had her firsts taste of a (fondant) baby head and that surely gave her the energy, aka sugar rush, to play with her dad and other kids in Active Fun downstairs. I was told she made quiet a riot there while I was learning new things to help her achieve more firsts. The product launch was followed by another first from Pampers: FirstBook. It's one of easy and creative ways to record baby's firsts that I shared last month. Start using the app now and publish your FirstBook movie. Share your personalized video of your baby's firsts and sahre on Facebook with hashtag #FirstsWithPampers. Moms who share baby's FirstBook Movie stand a chance to win 1 year worth of all-new Pampers Baby Dry. Pampers Baby Dry is now available in all stores nationwide, while moms can access FirstBook via http://www.firstbook.ph.